With more and more people working at home, its no wonder home offices are evolving. Now homeowners are demanding desks and storage pieces that are flexible, functional, and unique. The fashion-forward Dylan Demilune desk is just that. Dylan brings a fresh color palette and a feel of updated elegance to your office or workspace. 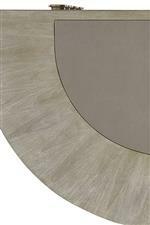 The distressed look comes from a wirebrushed finish and a white glaze that highlights the wood grain. The desk offers ample storage with a lockable file drawer, center keyboard drawer, and removable pencil tray. The inlaid desk top of gray faux leather is a finishing touch not to be missed. The Greystone Dylan Demilune Desk with File Storage and Faux Leather Writing Surface by Sligh at AHFA in the area. Product availability may vary. Contact us for the most current availability on this product.